rec. Cathedral, Altenberg, Germany, 1985. Notes in English and Deutsch. Full organ specification. Altenberg Abbey, once the largest Christian Church in the world, was largely destroyed during the French Revolution and the ensuing wars. It was partially restored in the nineteenth century with funds contributed by the Prussian King Friedrich Wilhelm IV on condition that the restored church would be available for use by both Catholics and Protestants. It wasn�t until 1980 that the organ was installed. 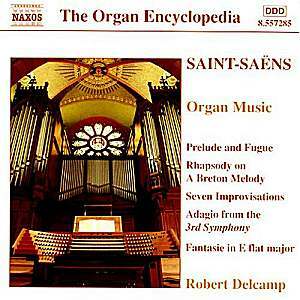 The St. Martin�s organ has an unusual history. Built as a Romantic-voiced organ in 1912, in 1962 it was revoiced in an attempt to make it a Baroque organ, and then in 2001 it was restored to enhanced Romantic splendor, with a bombarde stop replacing the Rückpositiv. The organ also, along with most modern instruments, has a MIDI interface allowing complete concerts to be recorded and played back on this or on another organ with a MIDI interface. The Breton melody in the Rhapsody turns out to be the tune from Smetana�s Die Moldau. How the tune got from Bohemia to Brittany, or vice-versa is not explained, but clearly European folksongs traveled long distances. How else did a Hungarian song get to be the national anthem of Canada? The problem with these disks is the music. 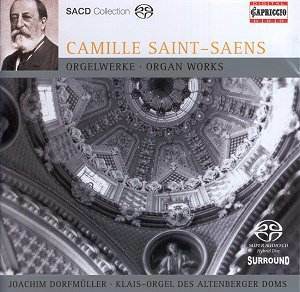 We love Saint-Saëns largely because he was a great tunesmith, but his organ works are built on rather bland musical material, worked with some skill, to be sure, but to what effect? Everyone seems to agree that his greatest organ works are the Prelude and Fugue Op. 99 No. 3, the Fantasie in E flat and maybe the Improvisation Op. 150 No. 7; but, however well they are played and recorded on these two disks, they remain uninteresting. You can�t blame the performers. I have the scores to this music, and once tried to play it myself, but was unable to generate any enthusiasm for it, and now I feel vindicated that these fine artists can make no more of the music than I could. Saint-Saëns was a very popular performer. After he had officially retired, he decided he wanted the experience of playing before an audience once more, so he offered to play (I recall reading) the Schumann Concerto with a small provincial orchestra on condition that they keep his name a total secret. The day of the concert arrived and the mystery pianist appeared only to discover that there had been an information leak, and the small hall was overwhelmed with thousands of cheering people who had come great distances to hear their idol perform once more. So one is justified in believing that in the hands of the composer these pieces came brilliantly to life. But as they stand they�re less interesting than second-rate Hindemith or Reger. Can we love third rate music by a favorite composer out of sentimental value, thinking that we are somehow close to his heart, thinking he is more accessible when he isn�t being "great"? These disks feature both beautiful organ playing and beautiful sound, but Saint-Saëns would have been better served by an anthology of his best two or three pieces coupled with works by Reger, Widor, Liszt and maybe even Franck. This would have made an "interesting" concert showing the confluence of musical styles at the time.